If you are a Conversations Agent, you can respond to chats and inbound emails from the unified inbox. All users with Agent permissions will be able to see and respond to messages in the Conversations unified inbox. Once a message is opened, it will appear as “Read” for all agents. If a message is marked as complete, it will appear as “Complete” for all agents. In addition, the message will appear in the left menu of the Conversations unified inbox. You can choose to respond to the message using chat or email. Note that Conversations will automatically select Chat or Email depending on whether the visitor is online or offline. 1. Click the message in the left menu of the Unified Inbox to open it. 3. Type your message in the message composer and click "Send." The visitor will see your message in the chat widget and will be able to respond. In addition, you’ll see your response in the conversation thread above the message composer. The chat label under both the visitor’s message and your message indicates that the exchange took place over chat. If the visitor is no longer online, you can respond to their message using email instead. 2. Type your response in the message composer located at the bottom of the conversation. 3. Click the “Send” button to submit your reply. Note that in order to use the email option, the visitor must submit their email address to the Email Capture Form or be a known contact in your ActiveCampaign account. Your email will be sent to the recipient and a thread of the chat will be included. In addition, you’ll see your email response in the conversations thread above the message composer. Messages in the conversation thread will show both the chat label and email label because the conversation took place in both channels. You can respond to emails from your contacts. This includes replies to emails sent from the unified inbox, replies to campaigns and automation emails, and any emails forwarded to the unified inbox. Each new email that arrives in the unified inbox will either be associated with an existing contact and any conversation that may already exist. 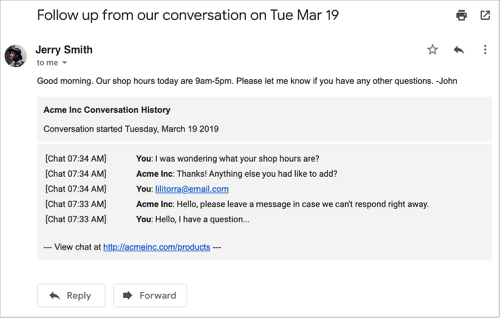 In the case of an email received from an unknown email address, a new Contact will be created with a new conversational thread in the Inbox. 1. From the Conversations unified inbox, click the message in the left menu to open it. 2. The message will load. To reply to the contact’s email, make sure “Email” is selected in the channel dropdown. 3. Type your response in the message composer located at the bottom of the conversation. 4. Click the “Send” button to submit your response. The email will be sent to the contact and they’ll see their conversation thread in the message. In addition, you’ll see your email response in the conversations thread above the message composer. The email flag in the conversations thread indicates that the conversation happened through email. Once the conversation is done, you can click the “Complete” button at the top of the interaction to mark it as finished. A checkmark next to the message in the left menu indicates that the conversation is complete. If a visitor reopens the chat widget from the same device, they will see their chat history load in the widget, even if they did not submit their email address to the Email Capture Form. 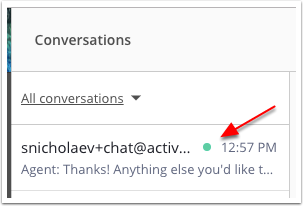 Any new message they send via chat or email will be added to their conversations history in your unified inbox and the conversation will be marked as “Open.” If a visitor clears their browser cookies or sends a message from a new device, then a new Conversation thread will start. Note that it's not possible to delete a Conversation thread from your account. You can send a thread of a chat to a contact by sending them a follow-up email from the Conversations Unified Inbox. This must be done immediately following a chat message. 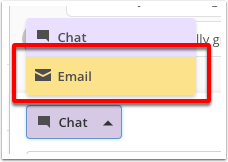 From the conversation, select “Email” in the channel dropdown. Then type your response in the message composer, and click the “Send” button. When the contact receives your email, they’ll see your message and a record of their conversation.